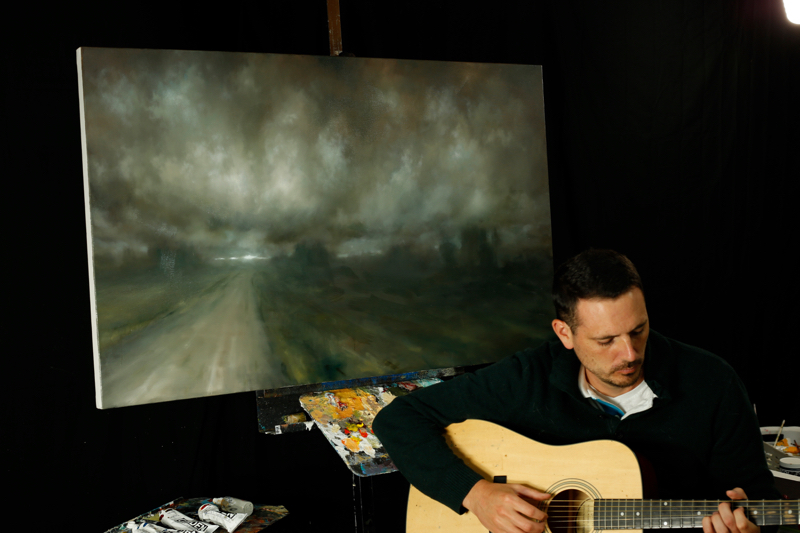 My latest painting lesson The Old Road Takes You There (pictured above) will be out soon. Pre-Order now and save! Click Here! Have you ever heard someone say that in a city, or in a town that resembles the movie set of ‘Deliverance?” Think about the history that road must have racked up to deserve that notorious statement. It’s a road that will take you places you don’t want to go, because if you do go down that road, you just might hear faint dueling banjos, and you know that can’t be good. Roads are fascinating to me, especially lately. Whenever I drive around I think about the road I’m on. How they become familiar and become, in a way, home. Whenever we are returning from taking our dogs on a ride, they all perk up when we turn onto the road to our house. Their ears go forward, they start looking back and forth out the windows, they whine a little bit and have this bouncy, slightly annoying, energy, because they know this is the way to their territory. 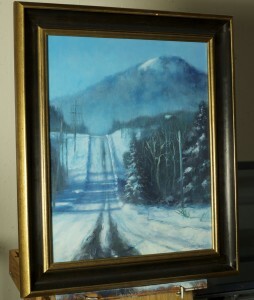 Press Down Road – Click the image to learn how to paint this painting! I think I’ve mentioned before that I live in the middle of nowhere in Northern Maine. Well, we have to drive about 50 miles to get to the nearest interstate. Most of the times when we go on trips we are driving long distances. After a long trip, driving hours and hours, it’s alway a great feeling to get on that last stretch of road that brings us home. In order to go to that wedding, funeral, first date, basketball game, family get together, we have to take roads. They hold an amazing significance that maybe we don’t always recognize. Old tar roads, dirt roads, highways, they all have their landmarks that we recognize, an old tree, a dilapidated building, and things that give us that nostalgic feeling. We go for drives on roads to unwind, de-stress, to think, listen to music, try out that new car, or just because we are bored and we want to cruise around with the windows down. 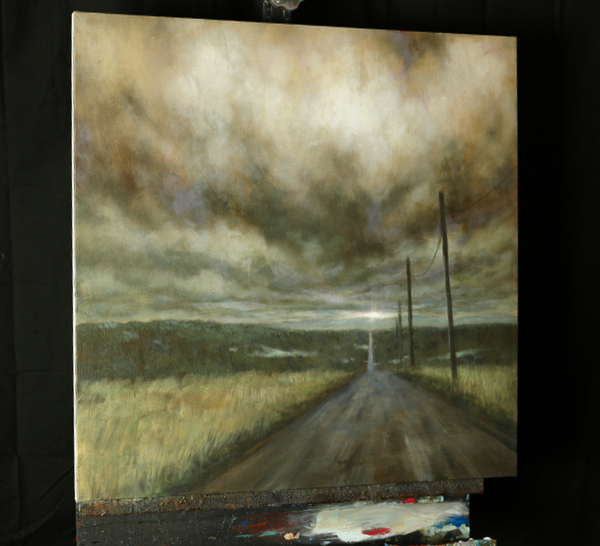 The Road Home – Click the image to learn how to paint this painting! This is why I’ve found a new fascination with painting roads. 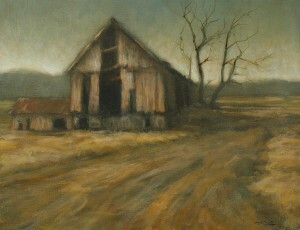 The final destination is a mystery in each painting, but it always holds significance to the person traveling that road. Symbolism is so important in paintings, especially landscapse (IMHO). It helps you get a theme or story across without being too literal. Symbolism gives your painting something to think about. Landscapes are mysterious in their own right, but sometimes people might look at them and move on without much thought. By adding in something for them to ponder over makes your painting stronger, and more fun to view. A road in a painting makes you travel into it and live there for a moment. Sometimes that’s just what we need in a landscape. An escape is easier if you have a road.